Green Roof Shelters Ltd brings together some of the foremost experts in green roofs planted for biodiversity, designing habitat creation, and low maintenance native planting, alongside designers experienced in producing buildings, structures, and retrofit products that enhance our environment. These include John Little, Dusty Gedge, Dan Monck, Duncan Kramer. 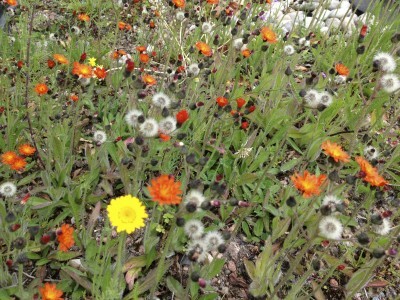 Orange Hawkweed or Fox and Cubs. Not strictly native but widely naturalised. A good greenroof plant, happy on soils 100mm + . Quite vigorous, we usually plant one reasonable clump on each roof. Great for bees, and if you’re like us, love orange!